There are multiple definitions of hypnosis from a variety of perspectives ranging from physiological to psychoanalytical. The American Psychological Association (APA) defines the practice as "a procedure during which a health professional or researcher suggests that a client, patient, or subject experience changes in sensations, perceptions, thoughts, or behavior." Hypnosis has offered adherents relief from pain, depression, anxiety, stress, habit disorders, and many other psychological and medical problems. It has been shown particularly effective during childbirth and in pediatric settings, and even provided anesthesia during surgery and painful medical procedures. Banyai, E.I. (1985a) A social-psychobiological approach to the understanding of hypnosis: the interaction between hypnotist and subject. Hypnos: Swedish Journal of Hypnosis in Psychotherapy and Psychosomatic Medicine, 12, 186-210. Ben-Zvi Z, Spohn WA, Young SH, Kattan M. (1982). Hypnosis for exercise-induced asthma. American Review of Respiratory Disease, 125, 392-395. Butler, L.D., Symons, B.K., Henderson, S., Shortliffe, L.D., & Spiegel, D. (2005) Hypnosis reduces distress and duration of an invasive medical procedure for children. Pediatrics, 115, 77-85. Faymonville, ME; Boly, M; Laureys, S. (2006). Functional neuroanatomy of the hypnotic state. J Physiol Paris, 99(4-6): 463-9. Flory, N., Martinez-Salazar, G.M., and Lang, E.V. 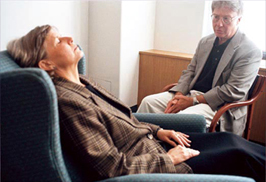 (2007) Hypnosis for acute distress management during medical procedures. The International Journal of Clinical and Experimental Hypnosis, 55(3): 303-317. Freeman, RM, MacCauley AJ, Eve L, Chamberlain GVP. (1986). Randomized trial of self-hypnosis for analgesia in labour. British medical Journal, 292, 657-658. Gottsegen, D. (2011) Hypnosis for functional abdominal pain. American Journal of Clinical Hypnosis. 54(1), 56-69. Hammond, D.C. (2007). Review of the efficacy of clinical hypnosis with headaches and migraines. Int'l Journal of Clinical and Experimental Hypnosis. 55(2), 207-219. Hilgard, E. R. and Hilgard, J. R. Hypnosis in the relief of pain. Los Altos, CA: William Kaufman, Inc., 1975. Hoffman, H.G., Patterson, D.R., & Carrougher, G.J. (2000). Use of virtual reality for adjunctive treatment of adult burn pain during physical therapy: a controlled study. The Clinical Journal of Pain. 16:3, 244-250. Hoffman, H.G., Patterson, D.R., Carrougher, G.J., & Sharar (2001). Effectiveness of virtual reality-based pain control with multiple treatments. The Clinical Journal of Pain. 17:3, 229-235. Houge, D.R. and Hunter, R.E. (1988). The use of hypnosis in orthopaedic surgery. Contemporary Orthopaedics, 16(4), 65-68. Isenberg SA, Lehrer PM, Hochron S. (1992). The effects of suggestion and emotional arousal on pulmonary function in asthma: A review and a hypothesis regarding vagal mediation. Psychosomatic Medicine, 54, 192-216. Jensen, M.P. (2008). The neurophysiology of pain perception and hypnotic analgesia: implications for clinical practice. American Journal of Clinical Hypnosis. 51(2), 123-148. Jones, M.B., Culbert, T.P., and Kohen, D.P. (2009). Pediatric Pain Management. Pediatric Update - An approved system for continuing medical education, 30(6), 1-10. Kaiser, P. (2011) Childhood anxiety, worry, and fear: individualizing hypnosis goals and suggestions for self-regulation. American Journal of Clinical Hypnosis 54(1), 16-31. Kohen, D.P. (2010) Long-term follow-up of self-hypnosis training for recurrent headaches: what the children say. The International Journal of Clinical and Experimental Hypnosis. 58(4): 417-432. Kohen, D.P. (2011) Chronic daily headache: helping adolescents help themselves with self-hypnosis. American Journal of Clinical Hypnosis. 54(1), 32-46. Kohen, D.P. and Wynne, E. (1997). Applying hypnosis in a preschool family asthma education program: uses of storytelling, imagery, and relaxation. American Journal of Clinical Hypnosis. 39, 2-14. Kohen, D.P. and Olness, K. Hypnosis and hypnotherapy with children. 4th edition (2011). Routledge: Taylor & Francis Group, New York. Kroger, W. Clinical and experimental hypnosis. Philadelphia, PA: J.B. Lippincott Co., 1977, pp. 1-7. Lambert SA (1996). The effects of hypnosis/ guided imagery on the postoperative course of children. Developmental and Behavioral Pediatrics, 17, 307-310. Landier, W., and Tse, A.M. (2010). Use of complementary and alternative medical interventions for the management of procedure-related pain, anxiety, and distress in pediatric oncology: an integrative review. Journal of Pediatric Nursing. 25, 566-579. Lang E, Joyce JS, Spiegel D, et al. (1996). Self-hypnotic relaxation during interventional radiological procedures: Effects on pain perception and intravenous drug use. International Journal of Clinical and Experimental Hypnosis, 44, 106-119. Lang, E.V. and Rosen, M.P. (2002). Cost analysis of adjunct hypnosis with sedation during outpatient interventional radiologic procedures. Radiology. 222, 375-382. Lesmana, C.B.J., Suryanbi, L.K., Jensen, G.D., Tiliopoulous, N. (2009). A spiritual hypnosis-assisted treatment of children with PTSD after the 2002 Bali terrorist attack. American Journal of Clinical Hypnosis. 52(1), 23-24. Liossi, C. and Hatira, P. (2003). Clinical hypnosis in the alleviation of procedure-related pain in pediatric oncology patients. The International Journal of Clinical and Experimental Hypnosis. 51(1): 4-28. Lynn SJ, Kirsch I, Barabasz A et al. Hypnosis as an empirically supported clinical intervention: The state of the evidence and a look at the future. International Journal of Clinical Hypnosis, 48(2); April 2000: 239-259. Lynn, S.J. and Cardena, E. (2007) Hypnosis and the treatment of posttraumatic conditions: an evidence-based approach. Int'l Journal of Clinical and Experimental Hypnosis. 55(2), 167-188. Mackey, E.F. (2010). Effects of hypnosis as an adjunct to intravenous sedation for third molar extraction: a randomized, blind, controlled study. The International Journal of Clinical and Experimental Hypnosis. 58(1), 21-38. Nash, MR. (2000). The status of hypnosis as an empirically validated clinical intervention. International Journal of clinical and Experimental Hypnosis. 48(2); 107-112. Olness and Gardner. (1978). Some guidelines for the use of hypnosis in pediatrics. Pediatrics, 62, 228. Pinnell CM, Covino NA. (2000). Empirical findings on the use of hypnosis in medicine: A clinical review. International Journal of Clinical and Experimental Hypnosis, 48(2), 170-194. Posner, MI and Rothbart, MK (2011). Brain states and hypnosis research. Consciousness and Cognition. 20(2): 325-7. Raz, A and Shapiro, T. (2002). Hypnosis and neuroscience: A cross talk between clinical and cognitive research. Archives of General Psychiatry. 59(1): 85-90. Rhue, J.W., Lynn, S.J., & Kirsch, I. (Eds.) (1993). Handbook of clinical hypnosis. Washington, D.C.: American Psychological Association. Spanos NP, Stenstrom RJ, Johnston JC. (1988). Hypnosis, placebo, and suggestion in the treatment of warts. Psychosomatic Medicine, 50, 245 - 260. Spanos NP, Williams V, Gwynn M. (1990). Effects of hypnotic, placebo, and salicylic acid treatments on wart regression. Psychosomatic Medicine, 52, 109-114. Spiegel, H. and Spiegel, D. (1978). Trance and treatment. New York, NY: Basic Books, Inc.
Syrjala KL, Cummings C, Donaldson GW. (1992). Hypnosis or cognitive behavioral training for the reduction of pain and nausea during cancer treatment: a controlled clinical trial. Pain, 48, 137-146. Whitehead, William E. (2006) Hypnosis for irritable bowel syndrome: the empirical evidence fo therapeutic effects. International Journal of Clinical and Experimental Hypnosis. 54(1), 7-20.